Book hotel rooms online with us at Hilton Vilamoura & Spa Hotel at the lowest rate, guaranteed. 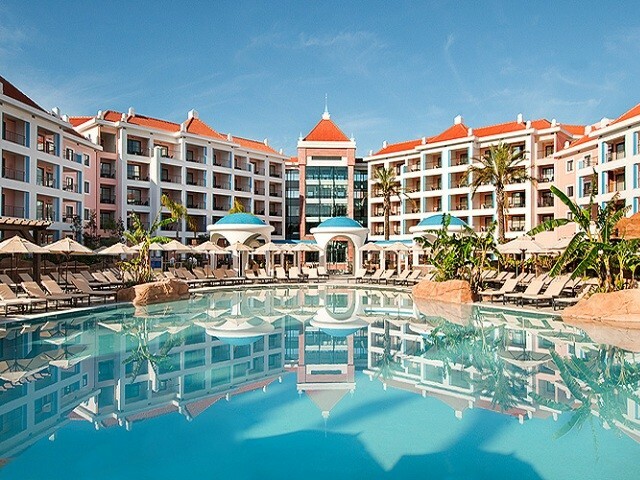 Get a holiday discount room rate at the 5 Star Hilton Vilamoura As Cascatas Hotel Golf & Spa in the Algarve. The hotel is next to the Pinhal Golf Course and there are a further five wonderful 18-hole golf courses virtually on the doorstep. The 176 modern guest rooms are set around lake-style outdoor pools with waterfalls and the extra-large 7 Seven Spa and seven acres of landscaped gardens. All rooms are air-conditioned and have private balconies and guest can up-grade to apartments with a separate living area and a fully equipped kitchen.